The course of Automotive Technology is for the student who wants to learn is about automotive, truck and heavy equipment service and repair. 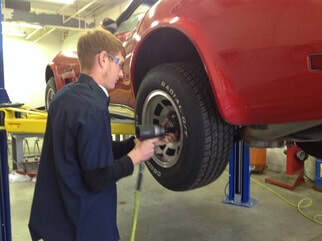 Students will spend time studying the fundamentals of the automobile and doing hands-on work on cars and trucks in the auto shop. 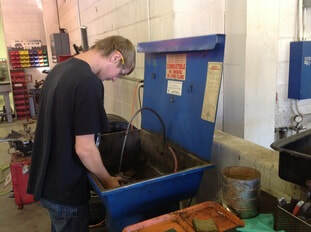 Students will work on vehicles doing oil changes, tire repairs, exhaust system repair, cooling system service, suspension service and other vehicle maintenance. This class is for people who are serious about becoming a professional automobile, truck or heavy equipment mechanic. This class is a continuation of the Automotive Technology course. Students will continue to do classroom study and in the shop hand-on work in the process of working towards the completion of all tasks required to meet the new national standards set by NATEF for “Maintenance & Light Repair”. This course satisfies the Fine Arts requirement of the Michigan Merit Curriculum. When taken in the senior year, this class fulfills the senior math requirement. Buchanan High School’s Automotive Technology program is certified by NATEF the National Automotive Technicians Education Foundation. Go to www.natef.org for more information.